Principal cities of the Oblast. According to Robert Service, in 1921 Joseph Stalin, acting the Commissar of Nationalities, forced the communist party Caucasian bureau to transfer Nakhichevan Autonomous Soviet Socialist Republic and Karabakh from nominally independent Armenia to Soviet Azerbaijani control to try to placate Turkey to join with Russia against Entente. Had Turkey not been an issue, Stalin would probably have left Karabakh under Armenian control. Location of the Oblast within the area claimed by the Republic of Artsakh. The conflict between the Armenians in the oblast and the government of the Azerbaijan SSR broke out in 1987. The fighting escalated into the Nagorno-Karabakh War by the end of 1991. On November 26, 1991, the parliament of the Azerbaijan SSR abolished the autonomous status of the oblast. 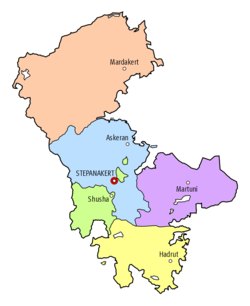 Its internal administrative divisions were also abolished, and its territory was split up and redistributed amongst the neighboring administrative raions of Khojavend, Tartar, Goranboy, Shusha, and Kalbajar In response, the majority Armenian population of the oblast declared their independence as the Nagorno-Karabakh Republic. Today, most of the territory of the former oblast is under the control of the Artsakh Defense Army. Upon the dissolution of the Soviet Union, the oblast was affirmed as being part of the newly independent Republic of Azerbaijan by several resolutions of the United Nations Security Council, namely resolutions 822, 853, 874, and 884. Today, the area of the former NKAO is under de facto control of the wider Republic of Artsakh. However, the republic has limited international recognition. Azerbaijan considers the former oblast to be a de jure part of that state. 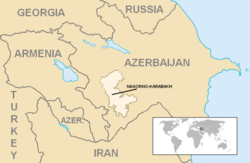 Azerbaijan dissolved the oblast as an entity of Azerbaijan by the Law on Abolishment of Nagorno-Karabakh Autonomous Oblast. This page was last edited on 30 March 2019, at 23:13 (UTC).